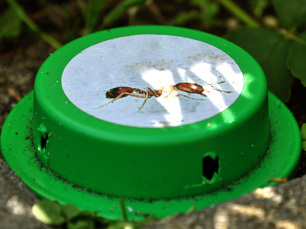 Fenitrothion use in the U.S. is currently limited to child-resistant ant and roach traps. Fenitrothion is an insecticide used to control insects that affect grain, fruit and vegetable crops, stored grains and cotton and forests. The EPA reports that the only use for fenitrothion in the United States is in child-resistant ant and roach traps, and it is not expected to be a water treatment concern. It is, however, used on some stored wheat that is imported from Australia to the United States. According to the World Health Organization, human exposure is most likely to occur through food. Fenitrothion can inhibit the enzyme cholinesterase, leading to symptoms of nausea, dizziness, confusion and, with exposure to very large amounts, respiratory paralysis and death. It is not believed to be carcinogenic. According to the EPA, fenitrothion may be treated with hydrolysis.